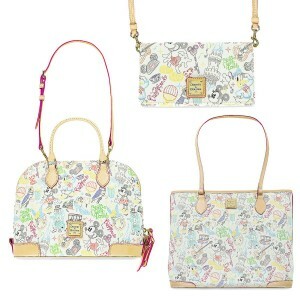 The Dooney & Bourke Disney Parks collection is updating a popular design and releasing several new handbag collections. The new design was “drawn in a coloring book style” according to Paola Gutierrez, Senior Graphic Design with Disney Consumer Products and Interactive Media Creative Group. The design features Mickey mouse, Donald Duck, and other park icons. The ‘A Walk in the Park’ design will be available in a Tote, Zip Satchel, and Crossbody Wallet in addition to being found on a limited release retail MagicBand. New silhouettes from Dooney & Bourke include a Pirates of the Caribbean Crossbody Bag, handbags inspired by The Princess and the Frog (as part of the Dream Big, Princess collection), and a collection featuring Madame Leota. The new handbags will be released July 22 at the Marketplace Co-Op in Disney Springs. Guests at the launch party can meet Ian Ray, Creative Director for Dooney & Bourke from 10:30 a.m. until noon. The collections will be available at select merchandise locations, the Disney Store online, and via the Shop Disney Parks app.